Heat grill. In shallow dish, combine all marinade ingredients; mix well. Add pork chops; turn to coat. Let stand at room temperature for 10 minutes to marinate. 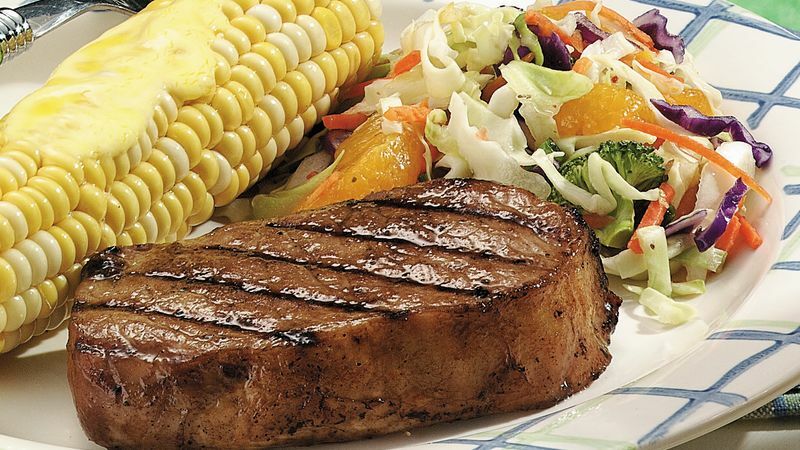 When ready to grill, remove pork chops from marinade; pour marinade in small saucepan. Bring marinade to a boil. Place pork chops on gas grill over medium heat or on charcoal grill 4 to 6 inches from medium coals. Cook 8 to 10 minutes or until pork is no longer pink in center, turning once and brushing frequently with marinade. Discard any remaining marinade. To broil pork chops, place on broiler pan; broil 4 to 6 inches from heat using times above as a guide, turning once and brushing frequently with marinade. Look for teriyaki marinade in the Asian-food section of the grocery store or at an Asian market. A mixture of 1/3 cup of soy sauce, 1 tablespoon of oyster sauce and 1 teaspoon of ginger can be used in place of teriyaki marinade. To give the sauce a more spicy-sweet flavor, add one crusted garlic clove and 2 teaspoons of grated fresh gingerroot. Grill extra pork chops for another use. Dice the grilled pork and add it to fried rice or use it in cold pork sandwiches.